VietPress USA (Jan. 27, 2019): On Jan. 21st, 2019, Democratic junior United States Senator Kamala Harris for California announced her campaign to run for President of the United States in the 2020 United States presidential election. Today Reuters reported that former Starbucks CEO Howard Schultz said Sunday he was considering a bid for U.S. president as an independent. Howard Schultz, born July 19, 1953, is an American businessman. He was the CEO of Starbucks from 1986–2000 and again from 2008–2017, as well as its executive chairman from 2017 to 2018. He is a former owner of the Seattle SuperSonics, and was a member of the Board of Directors at Square, Inc. in 1998, Schultz co-founded Maveron, an investment group, with Dan Levitan. He was named by Forbes in 2016 as the 232nd richest person in the United States, with a net worth of $3.1 billion as of April 2017. On December 1, 2016, Schultz announced his resignation as CEO of Starbucks, taking an executive chairman position, effective April 2017. He was succeeded as CEO by Kevin Johnson. On June 4, 2018, Schultz announced his retirement as executive chairman, effective June 26, 2018, becoming chairman emeritus, amid speculation he has U.S. presidential ambitions. In January 2019, speculation gained steam that Schultz was considering running as an independent candidate in the election; Schultz announced on January 27th that he would explore a bid as an independent candidate. Schultz, describing himself as a "lifelong Democrat," said Americans were tired of the behavior of both the Republican and Democratic parties. "I am seriously thinking of running for president. I will run as a centrist independent," Schultz said in an interview with CBS' "60 Minutes." His announcement is upsetting some Democrats who believe he would hurt their party's chances of defeating Republican President Donald Trump in 2020. "We’re living at a most fragile time. Not only the fact that this president is not qualified to be the president, but the fact that both parties are consistently not doing what’s necessary on behalf of the American people and are engaged every single day in revenge politics," Schultz told CBS. 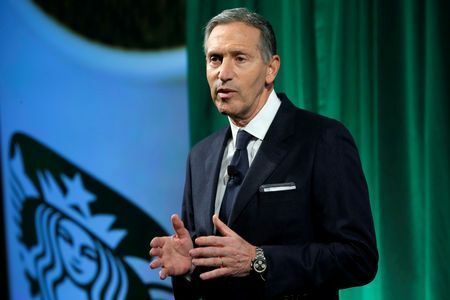 WASHINGTON (Reuters) - Former Starbucks CEO Howard Schultz said Sunday he was considering a bid for U.S. president as an independent, upsetting some Democrats who believe he would hurt their party's chances of defeating Republican President Donald Trump in 2020. Democrats responded to his CBS interview with concern that Schultz would take votes away from the Democratic Party nominee. Julian Castro, a former U.S. housing official who launched a bid for the Democratic nomination earlier this month, told CNN he was worried an independent run by Schultz "would provide Donald Trump with his best hope of getting re-elected." "There is zero appetite for this, and there is an urgent need for the Democratic candidate to win in 2020," Democratic Senator Brian Schatz of Hawaii wrote on Twitter. The Democratic Party in Schultz's home state of Washington circulated on Twitter a photo of a Starbucks coffee cup with "Don't Do it Howard!" scribbled on the side. The liberal-leaning Schultz, 65, is known for being outspoken on issues ranging from gay marriage to government gridlock. He announced in June he was stepping away from the coffee chain he built into a global powerhouse, fueling speculation about a possible presidential run. He had been a near-constant presence at Starbucks for nearly four decades and crafted the company’s inclusive culture. No independent candidate has ever won a U.S. presidential election, although some have played the role of spoiler. Asked why he was thinking about running as an independent, Schultz said over 40 percent of the U.S. electorate identifies as independent. Schultz, a billionaire, said, "We'll be fully resourced to do what is necessary" to run for president. Schultz, who introduced many Americans to upscale lattes and other espresso drinks, took the Seattle-based Starbucks from 11 cafes to more than 28,000 in 77 countries and produced big returns for many investors.